Photo above: the crater left by the Flight 93. Do you see any airplane? The Hollywood version of what happened to United Flight 93 has "set the record straight," boasts the senior counsel for the 9-11 Commission, while news reports and evidence tell a very different story. 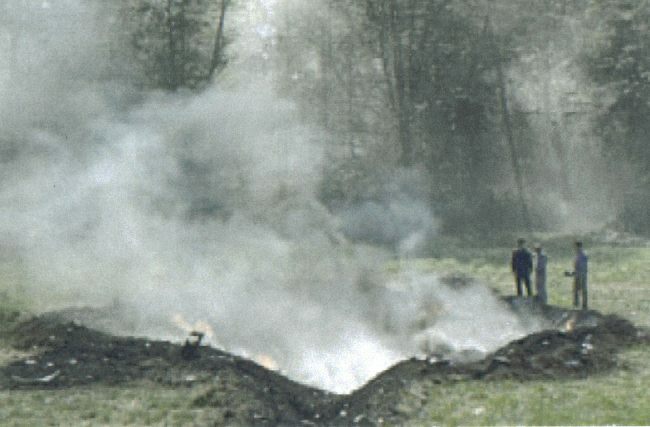 Photo: This crater, into which Flight 93 supposedly disappeared, appears much larger than it actually is because the men in the background are actually quite a distance behind the crater. The crater is no larger than 20 feet across and 5 or 6 feet deep, according to eyewitness accounts. How does a Boeing 757 disappear into such a small crater without leaving any trace of itself? And why are hundreds of millions of people tolerating such blatant lies? The recently released Hollywood film titled United 93 by Universal Pictures is touted by John J. Farmer as being "closer to the truth than every account the government put out before the 9-11 Commission's investigation." Farmer was an attorney general of New Jersey and served as senior counsel for the 9-11 Commission. "The facts of Sept. 11 are as simple as they are grim," Farmer wrote. "The passengers and crew aboard United Airlines Flight 93 really were alone. They were all that stood between the hijackers and the Capitol (or possibly the White House)," he wrote. "That is the core reality of that morning and United 93 gets it right." But the facts about 9-11 are anything but simple and the egregious omissions and distortions of the politically appointed 9-11 Commission, which Farmer worked with, have only further complicated the story, as author David Ray Griffin points out in his analysis of the commission's seriously flawed report. News reports and eyewitness testimony depict a very different fate having befallen United Flight 93 than either of those portrayed in the Hollywood film fabrication or the 9-11 Commission report. On the morning of 9-11, for example, the Associated Press reported that United 93 made an emergency landing at Cleveland Hopkins International Airport. According to the official version, however, Flight 93 crashed into a reclaimed mine near Shanksville, Pennsylvania, shortly after 10 a.m. The AP story clearly reported that United had identified the plane that landed at Cleveland as Flight 93. Cleveland's Mayor Michael R. White reportedly said the plane had landed due to suspicion that it had a bomb aboard. The most obvious problem with the official version that Flight 93 crashed at the site near Shanksville is that the photographs and eyewitness accounts describe a crater too small for a such a large plane to have crashed into. The crater at the reclaimed mine was less than 20 feet across and about 6 feet deep. Yet the official version claims that into this crater a Boeing 757 airliner supposedly buried itself, the passengers, the cargo, and thousands of gallons of jet fuel. Nena Lensbouer, who had prepared lunch for the workers at the scrap yard overlooking the crash site, said she was the first person to reach the crater. Lensbouer said that the crater was five to six feet deep and smaller than the 24-foot trailer in her front yard. She described the sound as "an explosion, like an atomic bomb" – not a crash. Somerset County Coroner Wallace Miller, who was one of the first people to arrive at the crash site, said it looked as if someone took a scrap truck, dug a 10-foot ditch and dumped trash into it. Miller said there was nothing visible of human remains and that it was as if the plane had "stopped and let the passengers off before it crashed." He said that the most eerie thing about the site was that he hadn't seen a "single drop of blood." Miller said he was stunned at how small the crater was. "I stopped being coroner after about 20 minutes," Miller said, "because there were no bodies there." Asked how Flight 93 disappeared into the crater without leaving a trace, Bob Leverknight, an active member of the Air National Guard and correspondent with Somerset's Daily American, told AFP at the newspaper's office, "It [the ground] liquefied." However, one of the massive engines, Leverknight said, inexplicably bounced off the ground and was found at a considerable distance in the woods. American Free Press called the former mayor at his 45-acre alpaca ranch, Seven Pines Alpacas in Newcomerstown, Ohio, to inquire about the events at the Cleveland airport on 9-11. White, however, was unwilling to discuss anything and cut the conversation short saying, "I'm out of the interview business." The central figure in the corruption of the White administration appears to be Samuel H. Miller, co-chairman of the board of directors and treasurer of Forest City Enterprises, Inc., a family-run company with extensive real estate holdings which it owns or manages. The Ratner family, which Miller married into, controls Forest City Enterprises. Ricardo Teamor, one of the co-defendants in the racketeering and extortion scheme with Nate Gray, told the FBI that Mayor White, Gray, and Miller had regular business dinners at the Ritz Carlton hotel for years. According to Teamor, Gray said that Miller controlled White and told the mayor what to do. Miller was White's biggest financial backer when, as a little-known state senator, White ran for mayor in 1989. Miller is also a national leader in Zionist and Jewish causes. He is, for example, the national chairman of the United Jewish Appeal (UJA), a past chairman of the Cleveland Jewish Welfare Fund and Israel Bonds, and a member of the board of trustees of the Jewish National Fund. Miller is also the father of Aaron David Miller, who served for two decades at the Department of State as senior adviser to six Secretaries of State, where he was involved in formulating U.S. policy on the Middle East and the Arab-Israel peace process. Miller served as the Deputy Special Middle East Coordinator for Arab-Israeli negotiations and Senior Member of the State Department's Policy Planning Staff. The UJA is the largest Zionist organization dedicated to raising money and support for Israel. Other individuals closely involved in 9-11, such as Larry Silverstein and Lewis Eisenberg have also held leadership positions in the UJA. Eisenberg, the former chairman of the Port Authority of New York and New Jersey, personally arranged the privatization of the World Trade Center property in 2001 and supervised the negotiations that delivered the 99-year lease to Silverstein only six weeks before the attack. Eisenberg was later appointed finance chairman of the Republican National Committee. AFP called Miller to ask what he knew about the events of 9-11 at the Cleveland airport. "Not a thing about it," Miller said. Asked about his relationship with Mayor White, Miller responded, "What business is that of yours?" AFP called the NASA Glenn Research Center to ask about the passengers that were taken to the facility on 9-11. "No one was brought here," said a puzzled NASA spokesperson, who was among those evacuated on 9-11. Mary Ethridge, a journalist with the Akron Beacon Journal, however, stood by the paper's report that the passengers had been interviewed by the FBI in the evacuated NASA facility. The facts indicate that a leading Zionist controlled the corrupt mayor of Cleveland, who in turn controlled the airport where suspicious and secretive events occurred on 9-11 in an evacuated NASA facility. Furthermore, NASA was under the control of a Zionist, as was the FBI, which was under the control of Assistant Attorney General Michael Chertoff. Chertoff, as AFP discovered, is an Israeli national whose mother, Livia Eisen, was one of the first agents in Israel's military intelligence agency, the Mossad.